Súlur Guesthouse offers two guesthouses very well located. The guesthouse at Þórunnarstræti 93 is open all year round. We offer 8 bedrooms for 1-4 persons with shared bathrooms and kitchen for guests to use. In every room is a TV and free wireless internet. Guests have access to laundry facilities and free parking in front of the house. The location is excellent, with only a 10 minute walk to the town center of Akureyri. The swimming pool and the Botanical Garden are all within a 300 meter distance along with the campsite and a supermarket. The guesthouse at Klettastígur 6 is open from the 1st of June until the 15th of August. 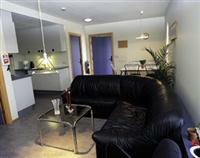 We offer three apartments each with four bedrooms, two bathrooms, kitchen and a living room with TV. Ideal for families or smaller groups to rent 2 bedrooms and have private access to a bathroom or small groups (max 10) to rent one apartment. Also suitable for individuals. The location is excellent, with only a 10 minute walk to the center of Akureyri. Good access for disabled people and a playground for children. Access to laundry facilities. Please note that check-in is at Þórunnarstræti 93.